Why do we use up-cycled leather ? Leather is a very long-lasting material, it can last thousands of years. So, why should we produce new when we can up-cycle? The guiding light of Crystalyn Kae Accessories is to create useful designs with luxurious materials that will stand the test of time. In the spirit of my first collection of bags beginning 17 years ago, that were made from vintage plaid wool pants, this Fall I have added rescued leather to my collection. I see this as the next step in reducing waste and taking advantage of rare high-grade Italian leather in a responsible manner. In New York City, the heart of American fashion manufacturing, I have access to a plentiful supply of exceptionally rare swatches, mill-end rolls, and even production leftovers from major designers and manufacturers. I have had the pleasure to collaborate with a local non-profit, Fab Scrap, to obtain my leather (and textiles) for my current collection. Watch a video of Crystalyn creating a pleated clutch from 100% reclaimed leather scrap here. . .and read the backstory of how it all began. What do you think about using reclaimed leather in our collection? What other materials would you like to see us design with? So much potential…I want to rescue all the leather! We source over 30% of our recycled leather for our bags at McPherson wholesale leather supply in Seattle. They collect leather scraps from suppliers all over the country and allow designers to purchase at a discount. 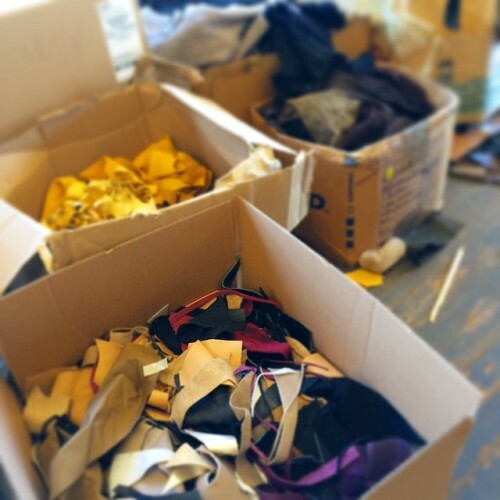 This provides us guilt-free access to gorgeous leather scraps, which we rescue to create our recycled leather handbags.